I recently found out about a new invention in the internet world: the blogcast. A mixture of the words ‘blog’ and ‘podcast’. In a blogcast (sometimes called an audio blog), the writer of a blog post records themselves reading it aloud. So you can listen and read along. Or read and then listen later. My language blogging colleague, Olly Richards from I will Teach You a Language, told me that blogcasts were really popular a couple of years ago. But then everyone started podcasting instead. 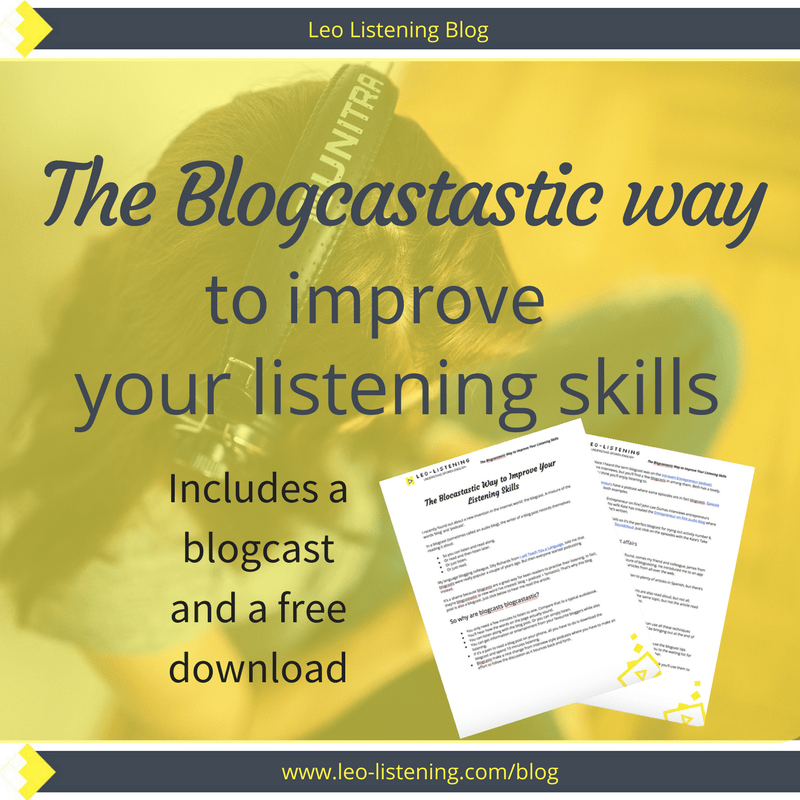 It’s a shame because blogcasts are a great way for keen readers to practise their listening. In fact, they’re blogcastastic (a new word I’ve created: blog + podcast + fantastic). That’s why this blog post is also a blogcast. Just click below to hear me read the article. So why are blogcasts blogcastastic? You only need a few minutes to listen to one. Compare that to a typical audiobook. You’ll hear how the words on the page actually sound. You can listen along with the blog post. Or you can simply listen. You can get information or entertainment from your favourite bloggers while also listening. If it’s a pain to read a blog post on your phone, all you have to do is download the blogcast and spend 10 minutes listening. Blogcasts make a nice change from interview style podcasts where you have to make an effort to follow the discussion as it bounces back and forth. How is this different from a podcast with a transcript? I know what you’re thinking. And no, a blogcast isn’t the same as a podcast with a transcript. A blogcast begins life as a written text. As a written, edited and published blog post in fact. So it’s organised into paragraphs and has an introduction and conclusion. A podcast is spoken. A transcript of a podcast will look different to a blog post. This is especially true for podcasts that are unstructured interviews. My podcast is a monologue, but I speak naturally and spontaneously, like I would in conversation. With a blogcast, you automatically have the written text because it started life as a blog post. Not all podcasts come with transcripts. It takes time and money to listen back to a podcast (unwritten apart from a few notes) and write out every spoken word. Blogcasts are slower and easier to understand than podcasts for 2 reasons. They started life as written texts so they have a more coherent internal organisation with paragraphs, an introduction and a conclusion, transition words etc. When we read aloud written texts, we tend to read more slowly and carefully. Compare the speed of an audiobook to the speed of film dialogue. Podcasts are normally faster. This of course depends on the podcast. Some are monologues where people speak a bit more slowly because they want to teach you something. Others are unstructured interviews where the interviewer and the guest sound like they’re having a chat. 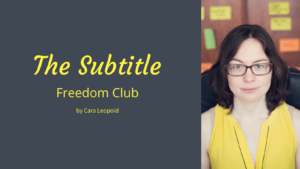 To show you the differences between a blogcast and blog post and a podcast with a transcript, here’s an extract from the transcript of one of my Cara’s Fast, Natural English Podcast episodes. Anyway, so to give you a very brief summary of the-the plot or the story errrrr so the main character in the book is a person called Rachel and she’s going through a difficult time in her life. Erm she’s got divorced, she’s become an alcoholic umm so it all starts out quite depressing I guess erm and everyday she commutes to London from her home in the south east of England. Erm and she looks out of the window at her old street and erm she notices that in one house there’s a-a new couple living there, they didn’t live there when-when she was there. And she starts to imagine things about their lives because she sees them uh every day, she sees them outside on their terrace and one day she sees something rather strange and that’s where all the plot and the-the intrigue starts err to take off. I make a few notes before I start recording my podcast episodes so I don’t forget anything important. But after that, I speak spontaneously and casually like I would in real life. That’s why in this extract you can see some features that would never occur in a written text. At least not in the same way. Or to the same degree. Hesitation sounds like ‘umm’ or ‘err’. We make these sounds to fill our pauses while we’re thinking about what to say next. Lots of coordinating conjunctions like ‘and’, ‘but’ and ‘so’. In writing, I try to use a variety of words to link my ideas. The sentences are quite long and rambly – I add lots of coordinating conjunctions and extra clauses to make the sentence go on and on. I’d never do this in writing. Repetition. I repeat individual words “a-a” or “when-when” “the-the”. I also repeat the same structures. In the last part, I repeat “she sees” three times. In writing, I would make an effort to vary my language more. I use the discourse marker “anyway” to introduce a new topic or spoken paragraph. This word is common in spoken language, but we don’t use it as often in writing. The “sentences” (utterances rather – a fancy word for a spoken sentence) are really long. In writing, especially when I write blog posts, I try to keep my sentences short. We don’t really speak in sentences, but for convenience, I’ve added some punctuation to the transcript. So how can you use blogcasts to better understand spoken English? The blogcast is above for you to listen to (and you can download it on Soundcloud, Stitcher or iTunes). Of course, you could just listen to the blogcast as another way to get the information from the blog post. But you know me. I don’t believe in just listening. I’m here to teach you how to understand. 1.Don’t read the blog post. Start by listening to the blogcast. Write down any new words as you listen. After, go back and compare them to the written version. Were they new words or just words you misheard? If they’re new, did you manage to spell them correctly? And can you guess their meaning from context? This is a bit easier in writing than when you’re listening. As you listen with the text, highlight any sections you don’t understand – why didn’t you understand them? Were there any new words? Was speed a problem? Did you miss some of the hard to catch details such as auxiliary verbs, articles or prepositions? Print out the blog post, cut up the text and mix the paragraphs. Try to rearrange it back into the right order. Listen to the blogcast to check. Did you put the text into the right order? Listen to the blogcast and make some notes about the key points. Compare your notes to the written blog post. Did you get all the main ideas? Are your notes similar to the headings and subheadings (perhaps your ideas are better!)? If the blogcast is on Soundcloud (like mine) then you can add a comment at any point on the soundwave. Maybe you have a question about something specific. Maybe you want to share an insight. Whatever it is, you don’t need to wait until the end of the blog post to leave a comment. Never used Soundcloud and not sure how to leave comments on the wave? Don’t worry, I show you how to do that in this video. Sometimes there are a few differences between the original article and the blogcast. The blogcaster might add some extra details or read the post differently from the original. As you listen, try to note down any new information or changes. This is an excellent ear training activity. Once you’ve listened to the blogcast a few times, you can do an activity that will help both your pronunciation and listening skills. You can do this with a podcast that comes with a transcript too. But you’ll find it easier if you start with something slower. Like a blogcast for instance. Choose a section of the blogcast. A paragraph for instance – don’t try to do the whole thing. Play this section. Straight away, follow the speaker and try to keep up with their rhythm and speed. This is not listen and then repeat. You’re trying to “shadow” the speaker. When you’re happy with your shadow reading, you can record yourself reading that section aloud. Send it to your teacher or a listening buddy for feedback. Who’s making blogcastastic versions of their blog posts? As you saw in the introduction, blogcasts aren’t as fashionable these days. But, I’ve managed to find some regular blogcasters. 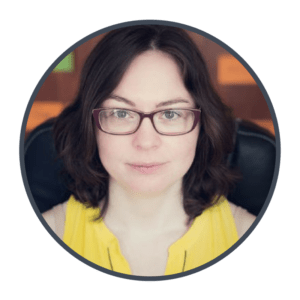 Anne Marie (who you’ll meet very soon on this blog) has turned her Speak Confident English lessons into podcasts too. 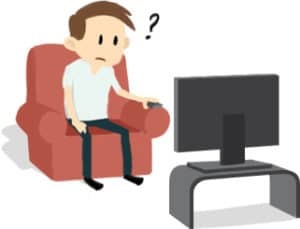 So you’ve got 3 ways to digest the material: reading the blog post, watching the video, listening to the podcast. You can find the podcasts here. If you want something a bit simpler, then make sure you try VOA Learning English. You’ll find articles read aloud and you can choose the level you want. Update: Shanthi from english with a Twist is now making blogcasts of her posts on her award winning blog – you can listen to the first one here. The very first place I heard the term blogcast was on the Introvert Entrepreneur podcast. Most episodes are interviews, but you’ll find a few blogcasts in among them. Beth has a lovely, clear delivery that I think you’ll enjoy listening to. The Creative Entrepreneurs have a podcast where some episodes are in fact blogcasts. Episode 17 and episode 21 are both examples. Have you ever listened to Entrepreneur on Fire? John Lee Dumas interviews entrepreneurs 7-days a week. Meanwhile, his wife Kate has created the Entrepreneur on Fire audio blog where she reads aloud blog posts she’s written. She tends to add a few extra details so it’s the perfect blogcast for trying out activity number 6. You can also find this blogcast on Soundcloud. Just click on the episodes with the Kate’s Take logo. Probably the most impressive resource I’ve found, comes my friend and colleague, James from Lingua Materna, and gives me hope for the future of blogcasting. He introduced me to an app called Linguoo which brings together narrated articles from all over the web. The developers are from Argentina, so you can listen to plenty of articles in Spanish, but there’s also a growing English section. On NPR (National Public Radio) some of the news reports are also read aloud, but not all. Sometimes you’ll click to listen and hear a report about the same topic, but not the article read aloud. You’ll find narrated articles from NPR on Linguoo too. What do you think of blogcasts? Had you heard of them before? Do you think you’ll use them to better understand spoken English? Let me know in the comments. I want to learn English with your blogcast.I can’t understand the word ” Website “. I don’t have to create ( make ) a website. ??? Your transcript helps me very much. Thank you. Hi Inoue. Thanks so much. I’m really glad you like it. I’m not sure I understand your question though – you don’t need a website. But it could be helpful for you to download the PDF. It’s easier than reading the blog post on the website.